If you’ve paid any attention online, you’ll know that Pauper has been on the upswing in recent months. As someone who was a fan of Pauper and Peasant in the past, you can imagine my eagerness to get playing again, now that chances of finding a game are improving. Preparing for a recent SCG Indianapolis trip, I knew I wanted to bring a paper Pauper deck. Like many, my first step was to take a look at what’s currently out there (for example, the Pauper metagame page on MTGGoldfish). Online, I primarily play Izzet Blitz, but I knew I was missing a lot of pieces for it in paper, and there wasn’t time to pull together the singles I still needed. I needed to dig deeper. After hours of sorting through thousands of commons, it was clear I had everything needed for a few decks, and among them, Burn was the most exciting prospect. Well, I had almost everything… I was missing Thermo-Alchemist—a relatively important tool used to block weenies and squeeze extra damage out of spells as the game progresses. Perhaps I didn’t quite have everything I needed for the netdecked build, but I did draft a ton of Amonket block. 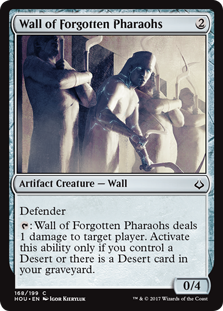 Staring at my piles of commons, I was reminded of another 2-mana creature that can block small creatures and chip in for additional damage over time—Wall of Forgotten Pharaohs. Part of the fun of Pauper is having an incredibly wide pool of cards from which to draw, so I started brewing. Without further ado, let’s take a look at my build for what I’m calling Desert Burn. If you’re at all familiar with the more popular Pauper Burn builds out there, you’ll see some immediate differences. Of course, I’ve already touched on the Wall of Forgotten Pharaohs substitution for Thermo-Alchemist. This swap necessitates a few other changes, however, since the Wall needs a Desert either on the battlefield or in the graveyard in order to ping your opponent. To fuel our Wall of Forgotten Pharaohs, this deck runs three copies each of Desert of the Fervent and Sunscorched Desert. Desert of the Fervent easily fills the slot typically taken by Forgotten Cave (though it costs an additional mana to cycle). Sunscorched Desert does not produce red mana, which can be a real problem in the early game. However, it does ping our opponent for 1 damage. This can provide added value over a basic Mountain later in the game when it turns on Searing Blaze or Needle Drop. Since Wall of Forgotten Pharaohs is totally fine with Deserts in the bin, this build runs two copies of Tormenting Voice. We can pretty freely pitch one of our Deserts if we flood out or just need to hit some gas. Beyond the Desert package, the deck is similar to other popular Burn decks you may see floating around. 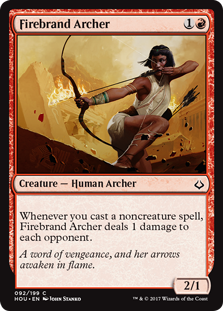 We run lots of spells that deal 3 damage—Lightning Bolt, Chain Lightning, Lava Spike, etc.—and Firebrand Archer to “pump” our spells by 1 damage. Since this build runs more nonbasic lands than typical, we do err on the side of running only two copies of Fireblast. The game plan is simple: send as much damage at the opponent’s face as possible, occasionally (and reluctantly) dealing with creatures if necessary. You’ve likely gathered by now that Desert Burn isn’t a straight substitution for you typical Pauper Burn deck. While most of the deck is the same, there are some real trade-offs to consider. In brief, here are some of the pros and cons I’ve found playing this deck. Sunscorched Desert deals damage to the opponent. This is colorless damage that triggers when you play the land, meaning there are very few ways to interact with this damage. Late in the game, a basic Mountain is often a dead draw when this Desert is not. It is also a way to turn on Needle Drop without resolving another spell first. 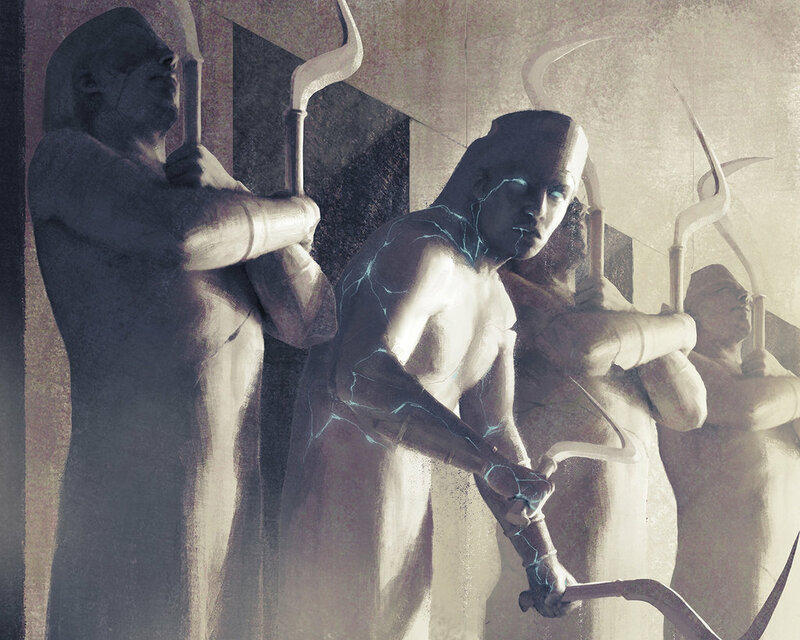 Wall of Forgotten Pharaohs is also a colorless source of damage, and its greater toughness means it is a slightly better blocker than Thermo-Alchemist. You get to play a fresh take on the classic Burn archetype. If playing something a bit different than the top tier netdecks is valuable to you, Desert Burn may be a fun choice. If you’re newer to Magic: the Gathering or play limited, you may already have some of the singles you need to get started. Desert Burn is 25% commons from Amonket and Hour of Devastation. There’s a chance you have these sitting around, and they will likely remain useful for various formats. Our Wall may be cute and unexpected, but Thermo-Alchemist frankly has a much higher ceiling on damage output. There will also be games where you just do not hit a Desert to turn on Wall of Forgotten Pharaohs, which is pretty bad. 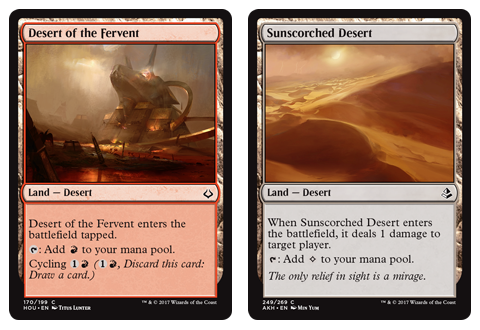 Dealing damage with Suncorched Desert is great, but the opportunity to be short on red mana is a serious consideration. You can get away with a land-light opening hand in Burn, but an opener that leaves you stuck on a single red mana for too long is bad news. Desert Burn often plays a bit slower than I’d like. It is true that the changes made to accommodate the addition of Deserts get better as the game goes longer, but Burn doesn’t want the game to go any longer than possible. Desert of the Fervent cycles for 1R, when Forgotten Cave only costs R to cycle. This leaves a higher chance that you’ll need to cycle without leaving mana to play the card you draw immediately. Even though this build runs a lot of more recent cards, you can’t get around the main burn package. You want to cast as many Lightning Bolt-like spells as possible, plus Needle Drop and Searing Blaze. Those cards see play in other formats, and that’s where you’ll spend most of your money in paper. 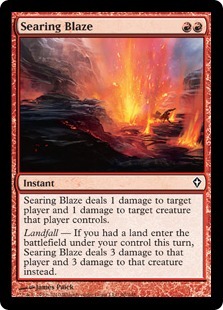 Searing Blaze gets much worse when your second land taps for colorless. Overall, Desert Burn is a fun spin on Pauper Burn, but its power level will depend on your meta. It isn’t necessarily too much slower than standard builds, but I must admit that the reliance on Deserts (one of which doesn’t provide critical red mana) limits opportunities for some of the more explosive starts Burn can have. 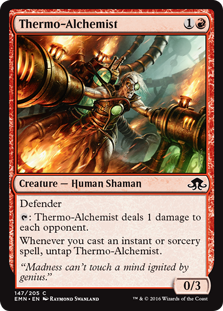 If Thermo-Alchemist is able to stay on the board for a few turns, the free damage can add up in a way that Wall of Forgotten Pharaohs simply cannot. My conclusions about this deck may sound a tad negative, but I really just want to make the trade-offs as clear as possible. Desert Burn can certainly go head-to-head with top-tier decks like Izzet Delver, but your mileage may vary. It’s also worth paying attention to the Deserts-matter cards in this list, because chances are good we’ll see Deserts appear in Magic again in the future. It may only take one or two more efficient cards to make a build like this overcome the sacrifices. Particularly if your meta is a bit slower, give Desert Burn a try!